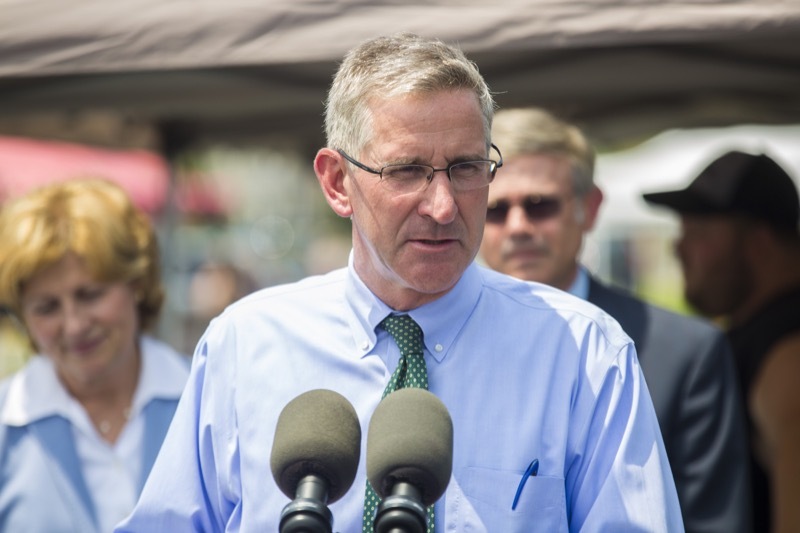 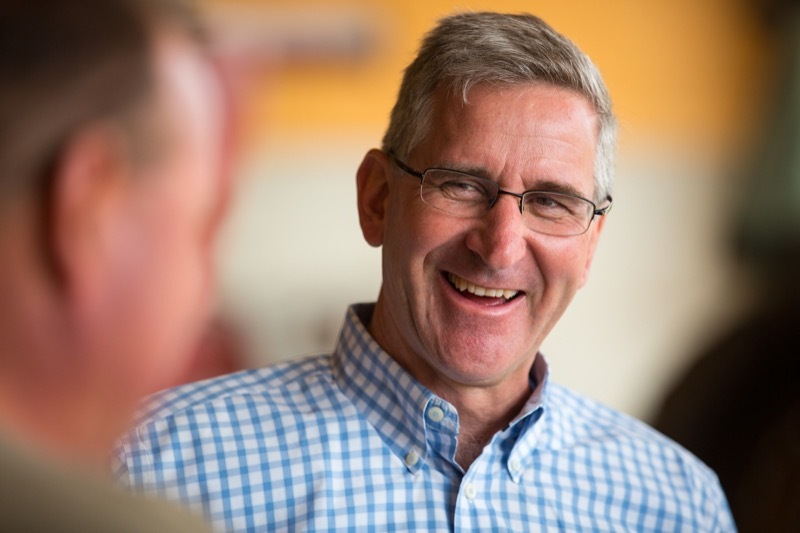 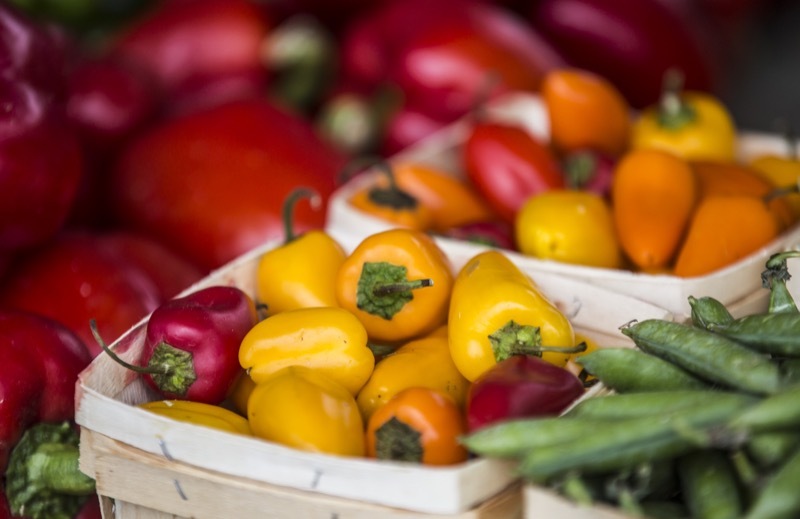 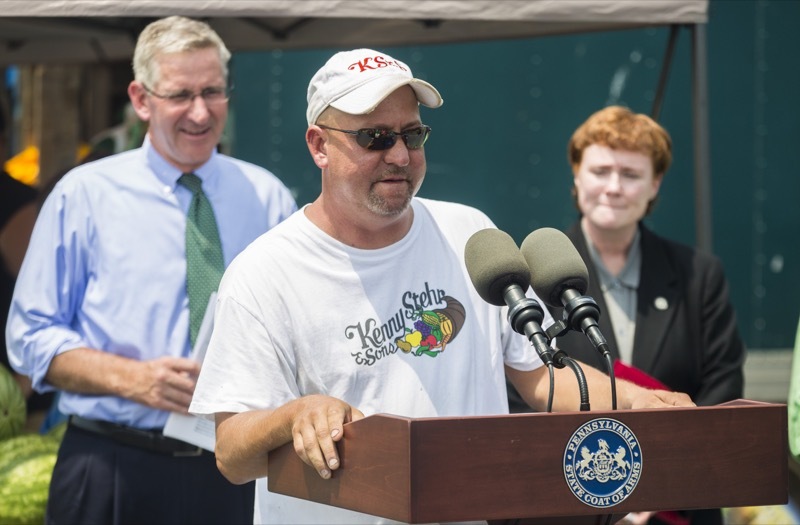 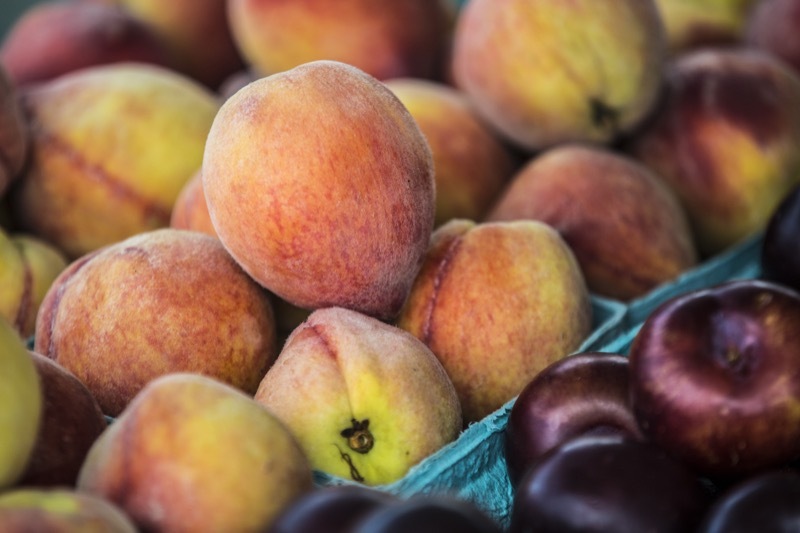 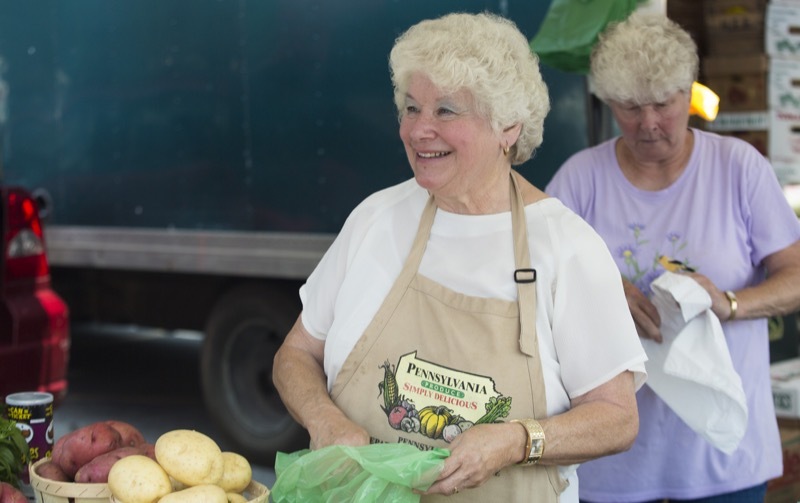 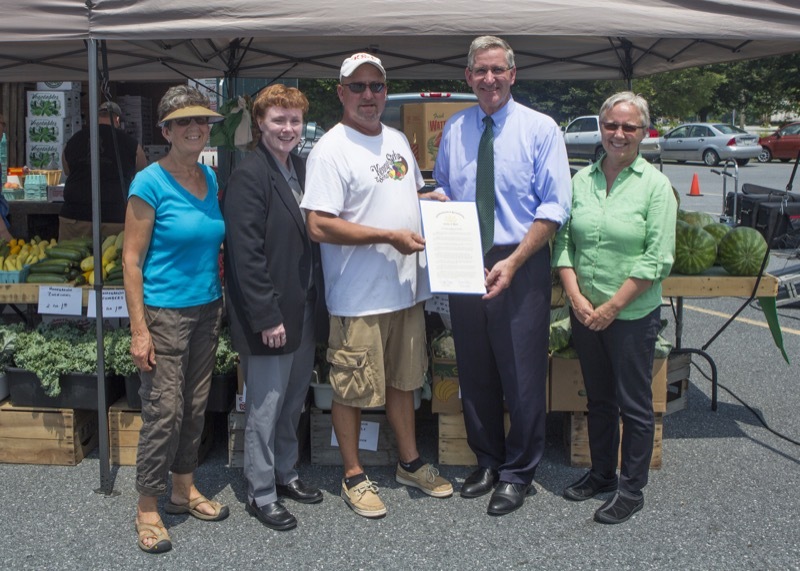 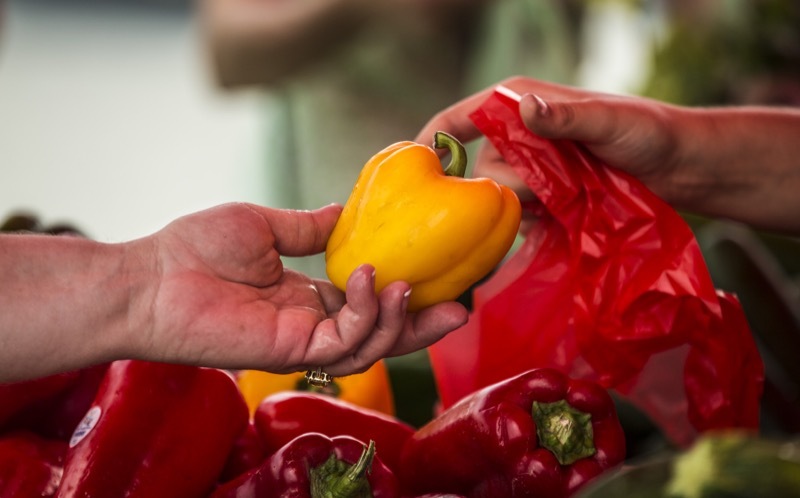 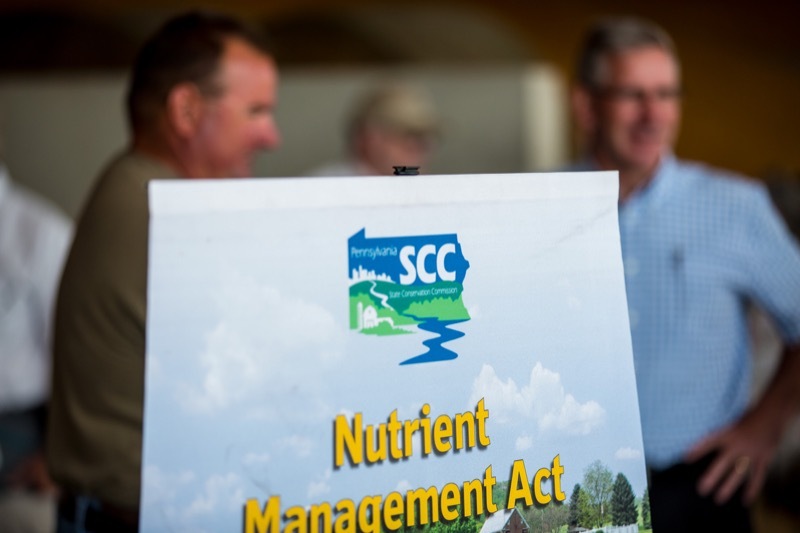 To remind residents of the importance of the consumption of nutritious healthy produce, Agriculture Secretary Russell Redding and Aging Secretary Teresa Osborne signed a joint designation this afternoon in recognition of June as the official start of the Farmers Market Nutrition Program (FMNP) in Pennsylvania. 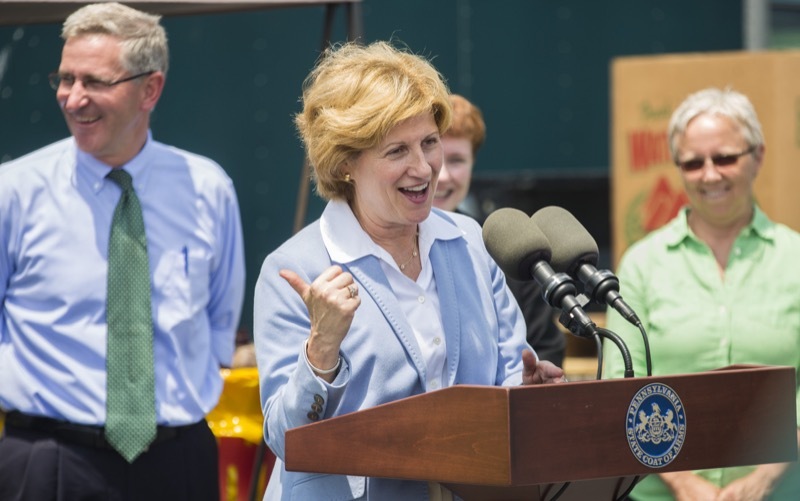 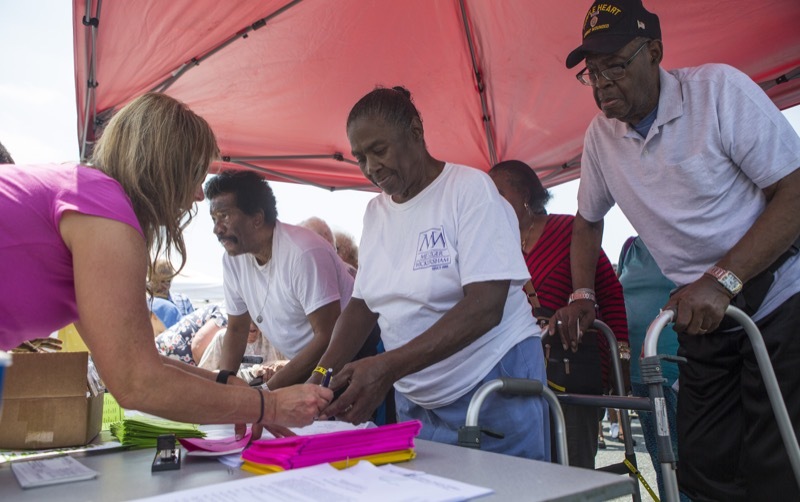 While visiting the PA Farmers Open Air Market at the Farm Show Complex in Harrisburg, the two cabinet secretaries encouraged eligible residents - particularly seniors and those individuals who participate in the Women, Infants, and Children (WIC) program - to redeem their FMNP vouchers by November 30. 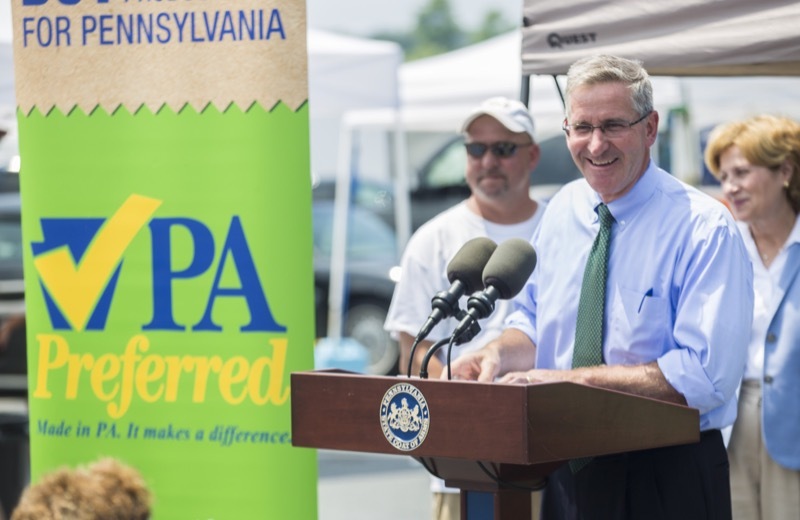 Harrisburg, PA - To remind residents of the importance of the consumption of nutritious healthy produce, Agriculture Secretary Russell Redding and Aging Secretary Teresa Osborne signed a joint designation this afternoon in recognition of June as the official start of the Farmers Market Nutrition Program (FMNP) in Pennsylvania. 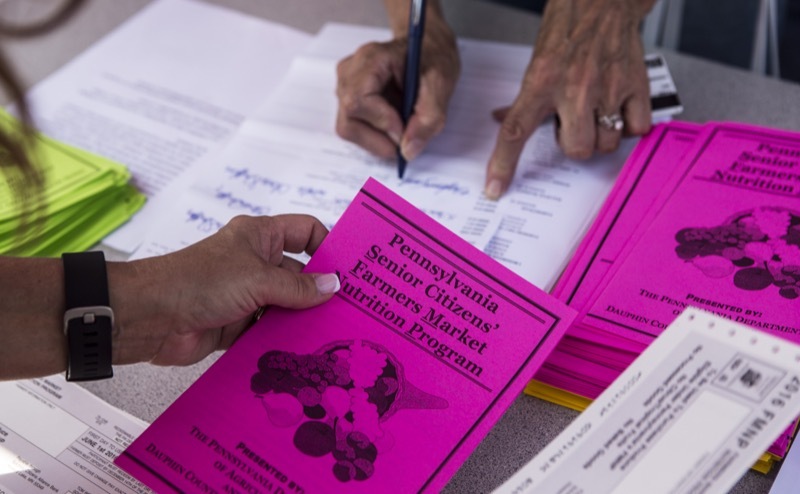 While visiting the PA Farmers Open Air Market at the Farm Show Complex in Harrisburg, the two cabinet secretaries encouraged eligible residents - particularly seniors and those individuals who participate in the Women, Infants, and Children (WIC) program - to redeem their FMNP vouchers by November 30. 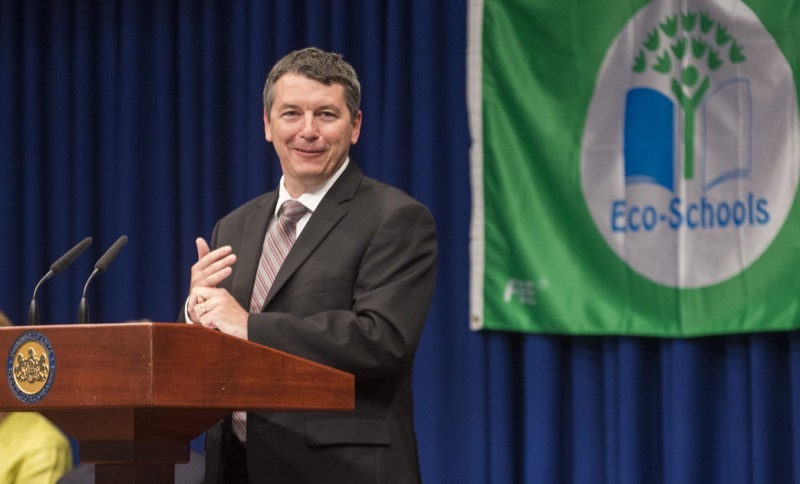 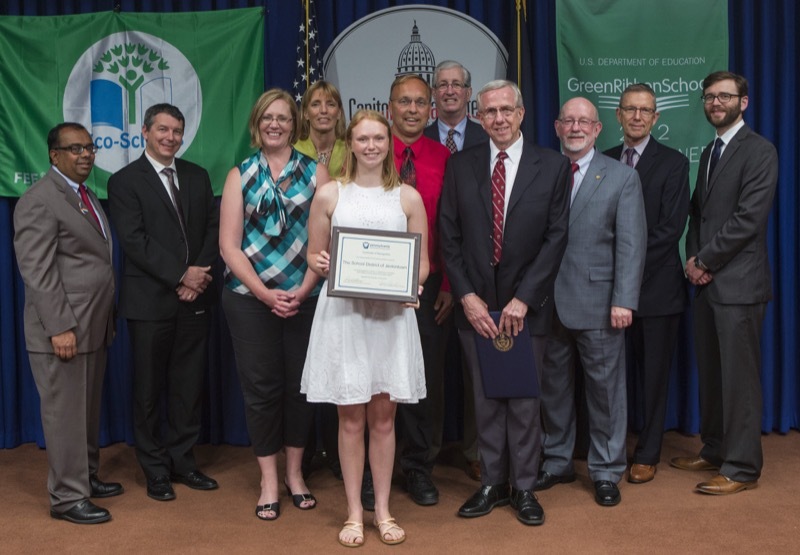 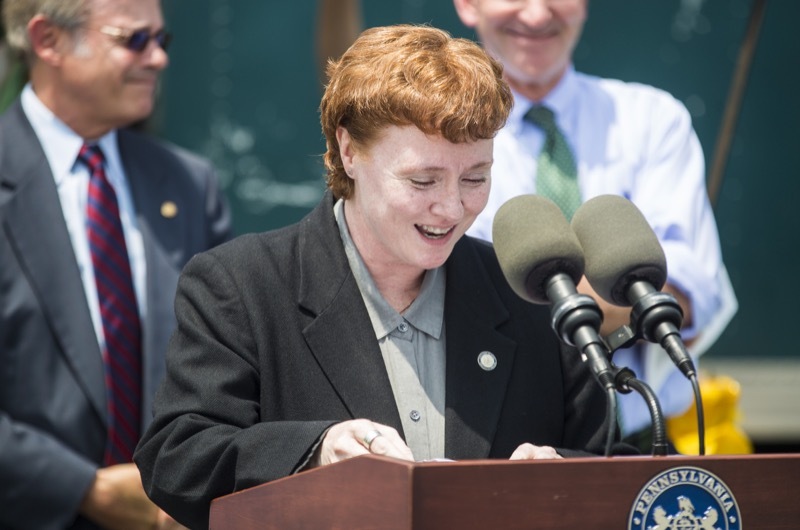 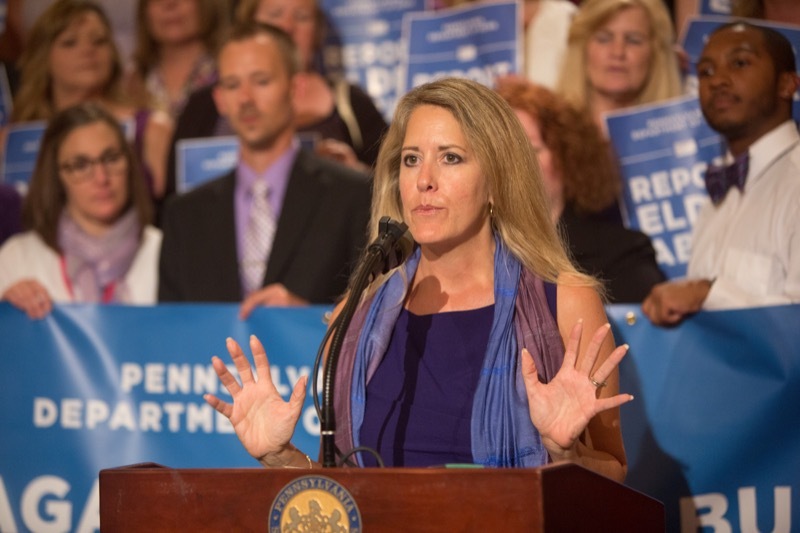 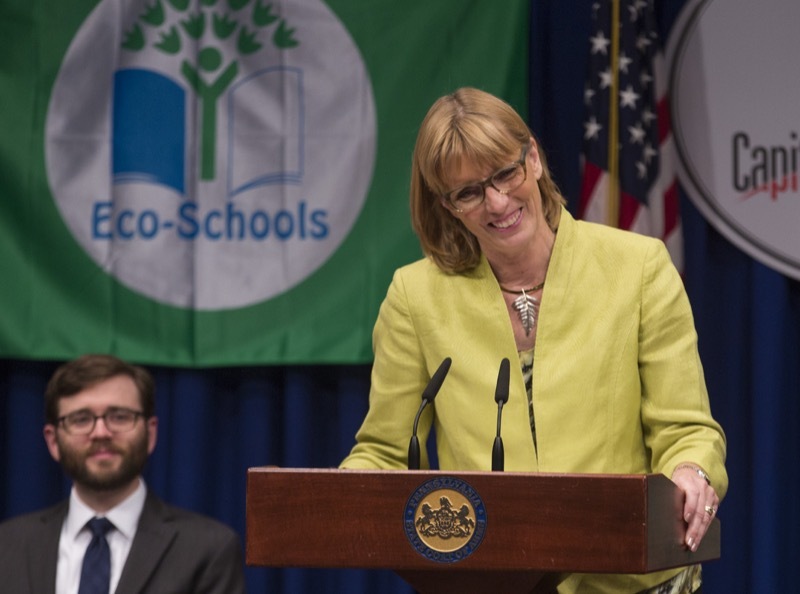 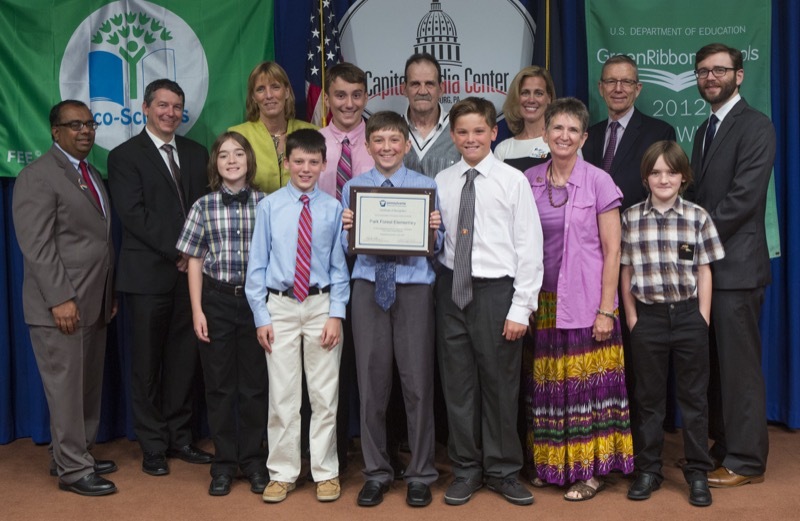 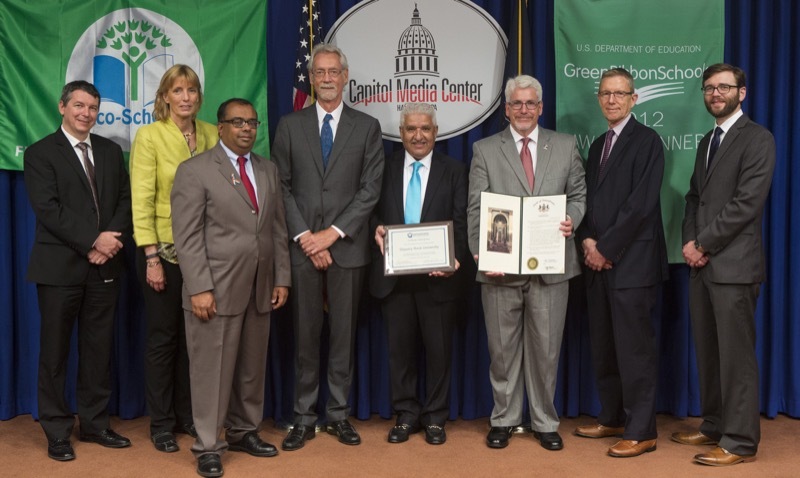 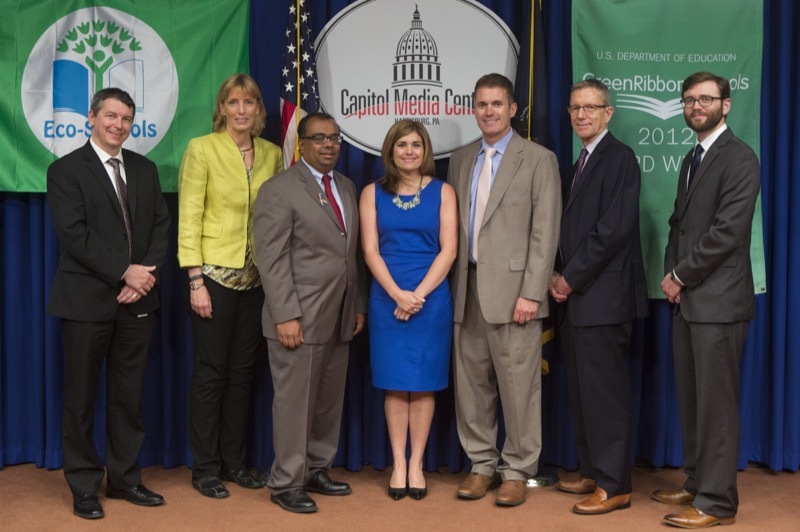 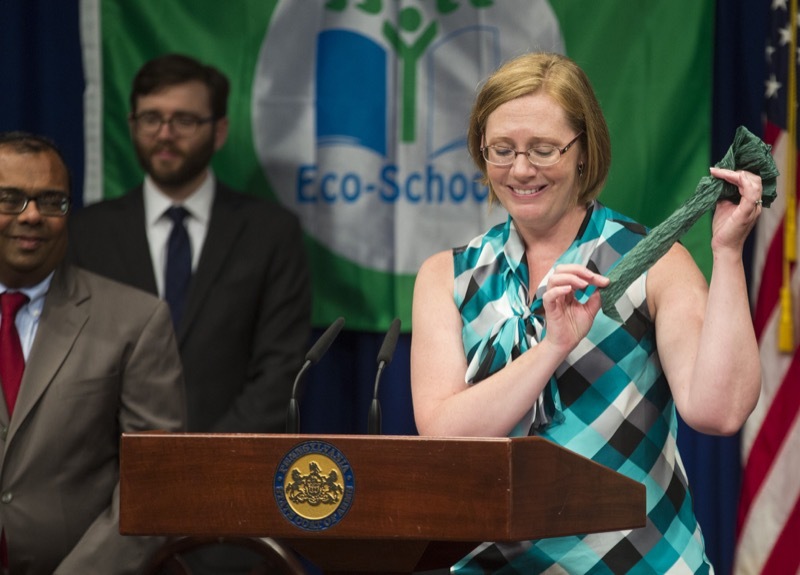 Environmental and education advocates gathered at the State Capitol Building today to honor three Pennsylvania schools that were named 2016 U.S. Department of Education Green Ribbon Schools (ED-GRS). 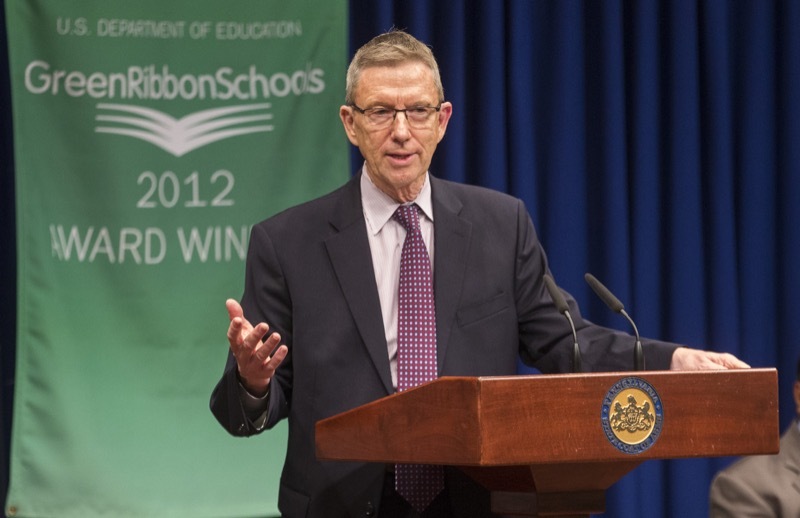 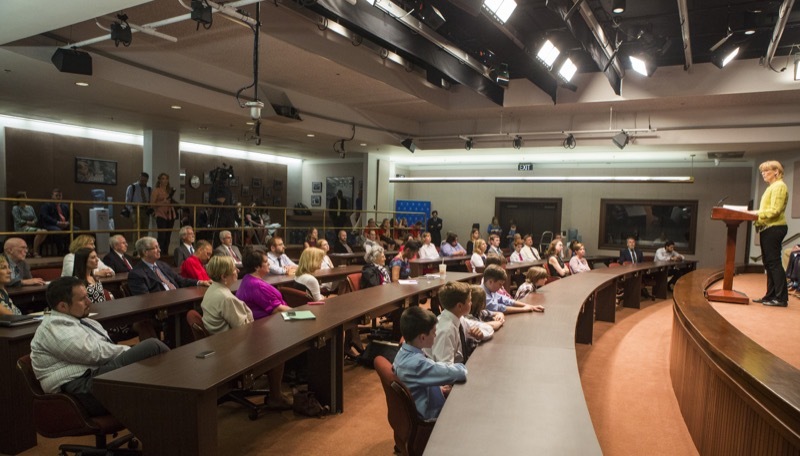 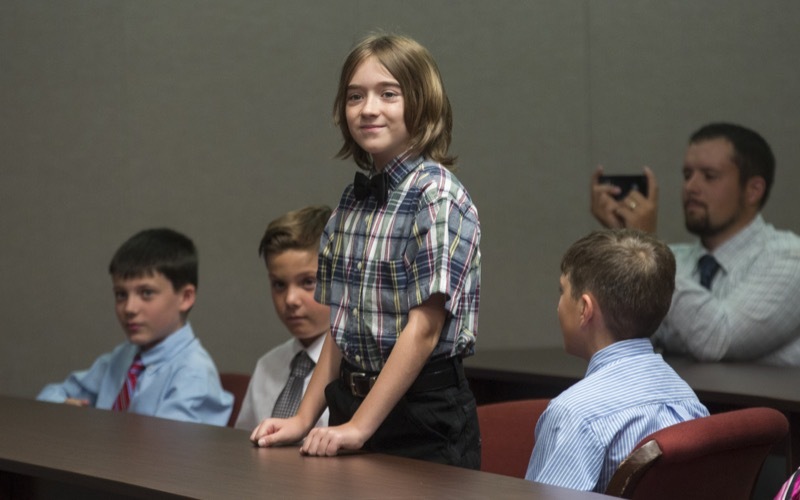 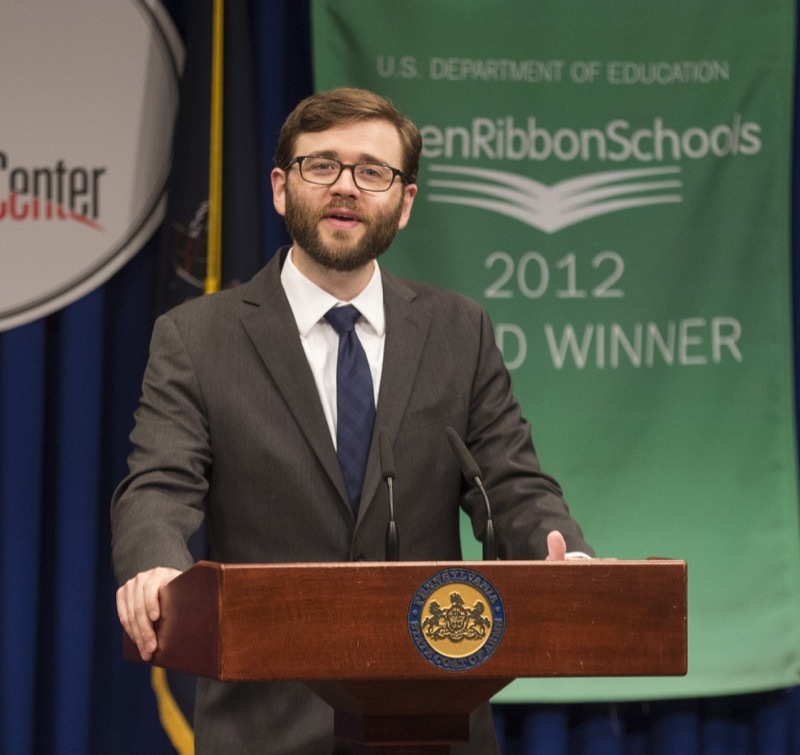 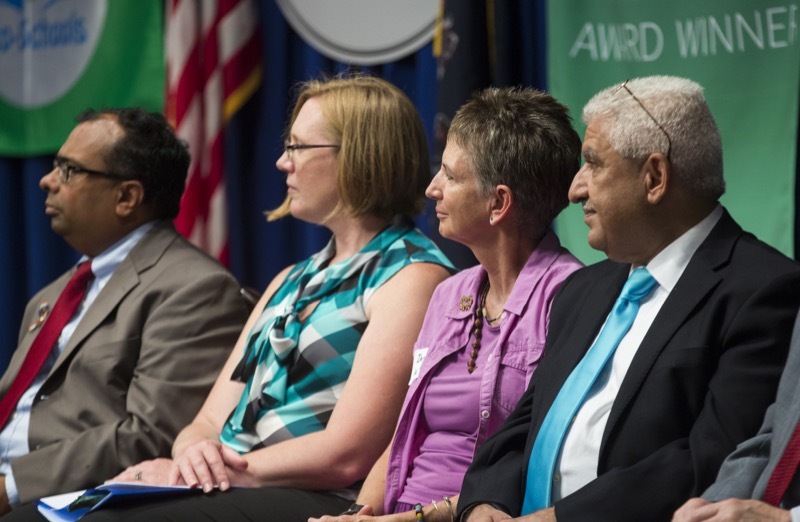 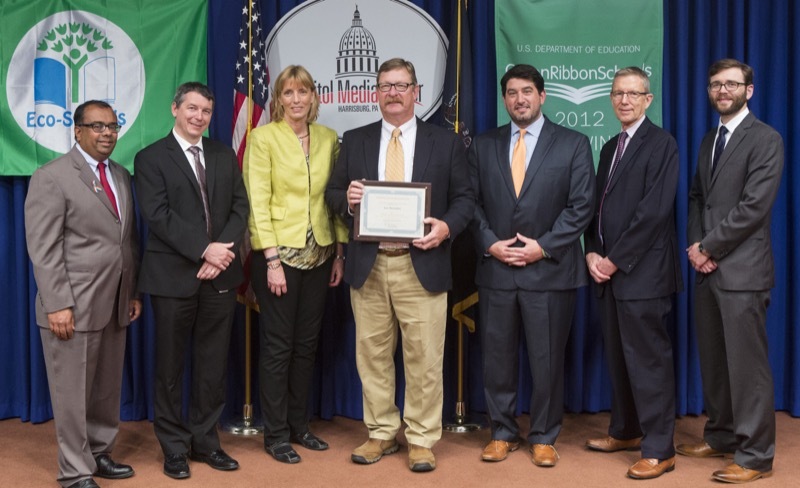 The School District of Jenkintown, Park Forest Elementary School (State College, PA), and Slippery Rock University were celebrated for receiving the prestigious, national honor at a press conference. 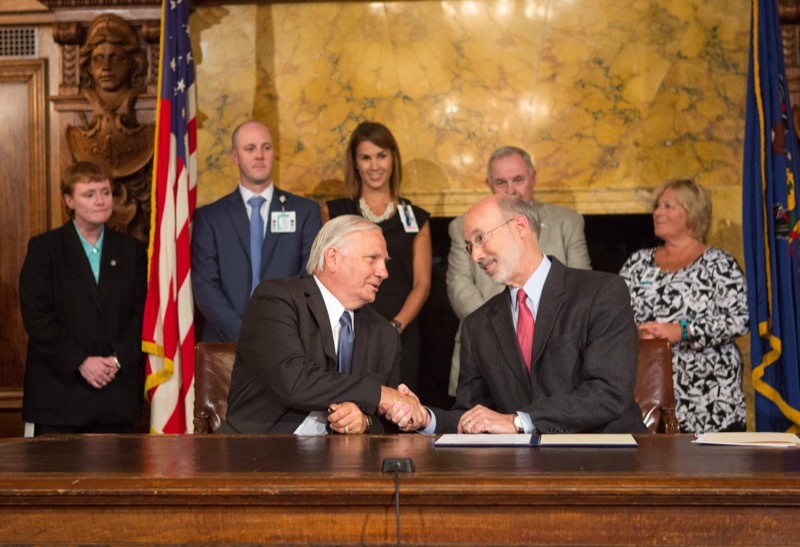 Today, Governor Wolf ceremoniously signed SB 609, sponsored by Senator Bob Mensch. 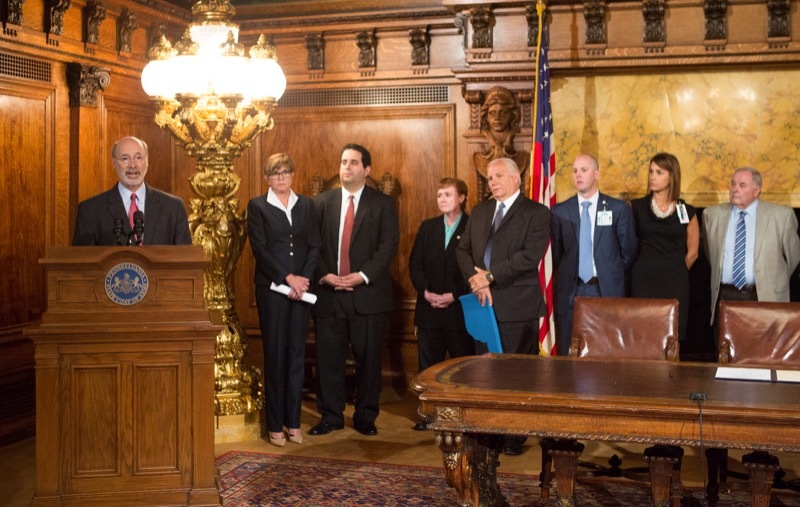 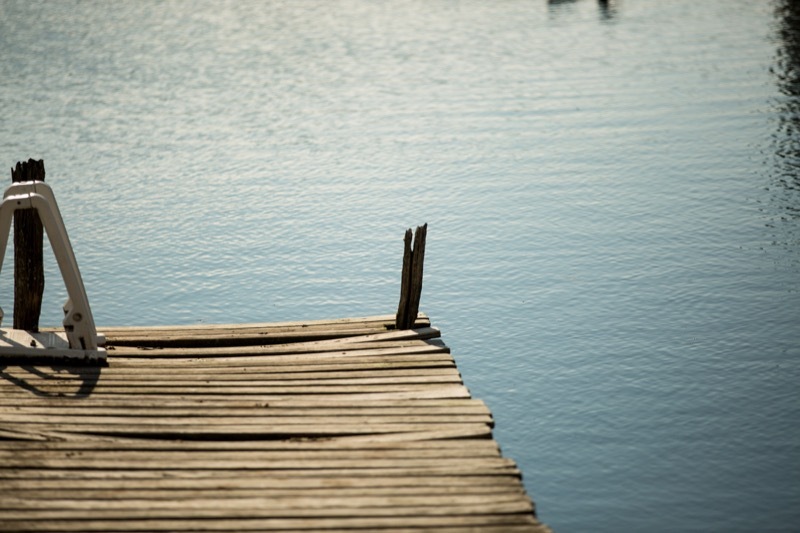 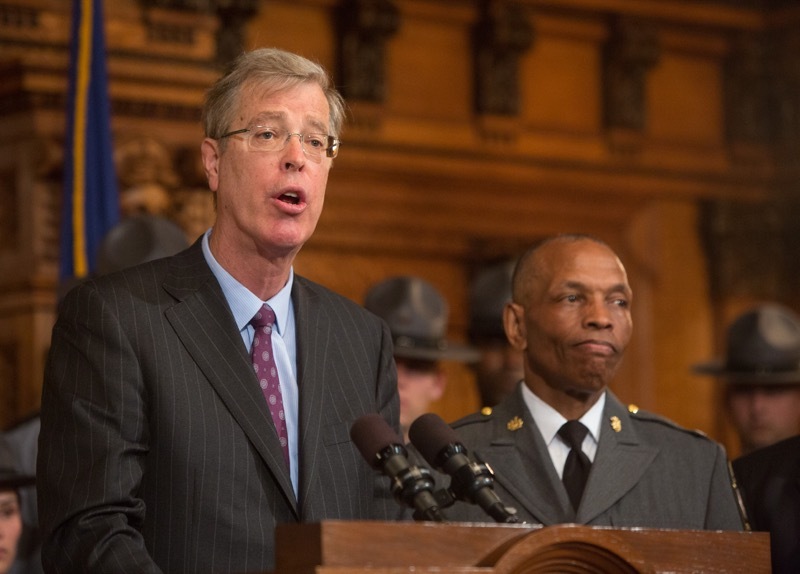 This bill creates greater public awareness of measures available to detect, diagnose and treat prostate cancer and related chronic prostate conditions. 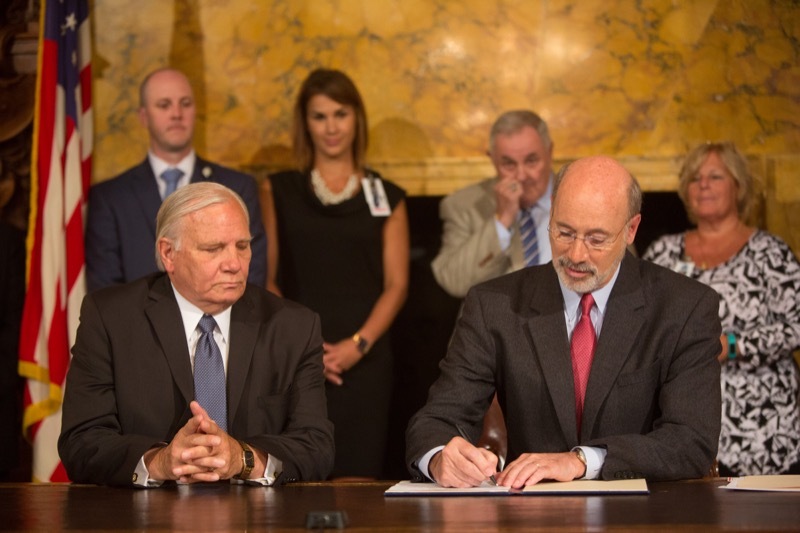 Governor Wolf ceremoniously signed SB 609, sponsored by Senator Bob Mensch. 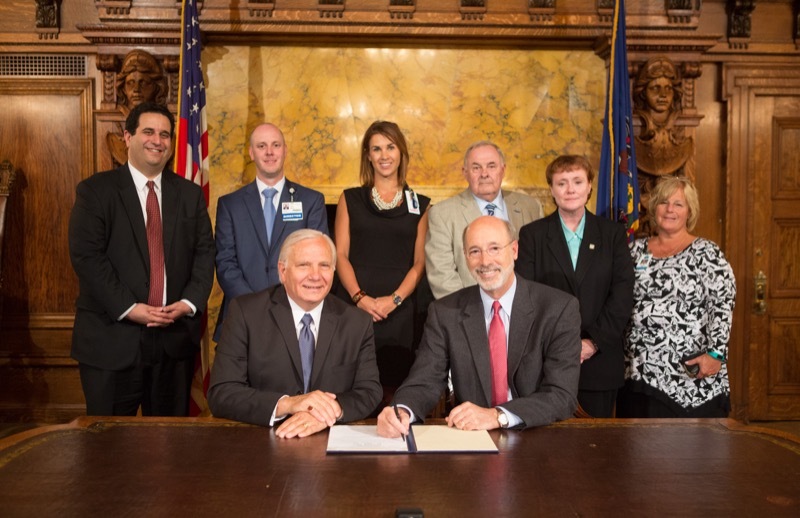 This bill creates greater public awareness of measures available to detect, diagnose and treat prostate cancer and related chronic prostate conditions. 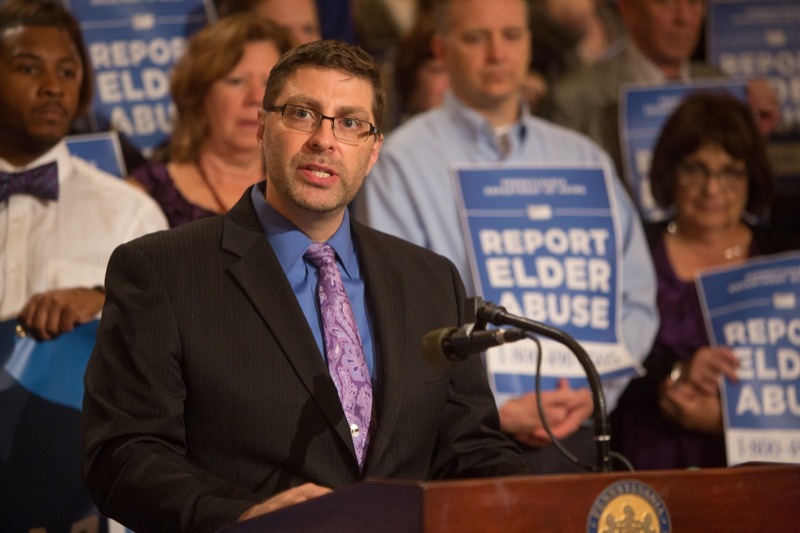 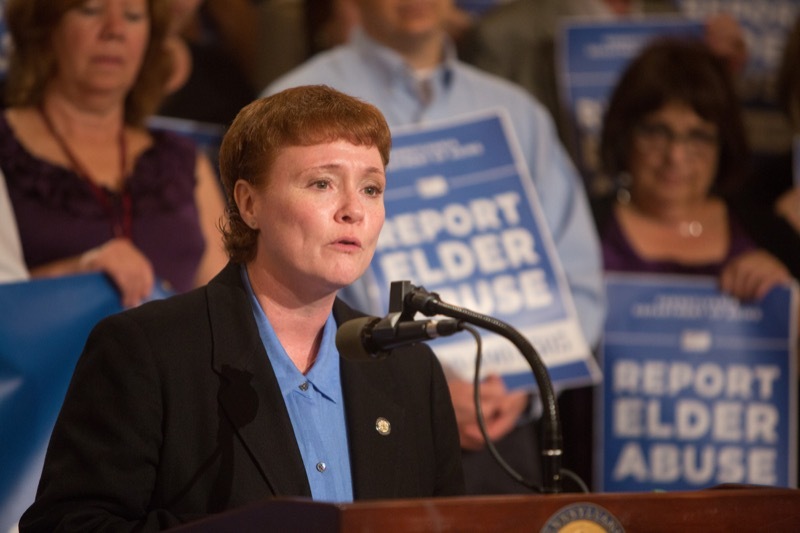 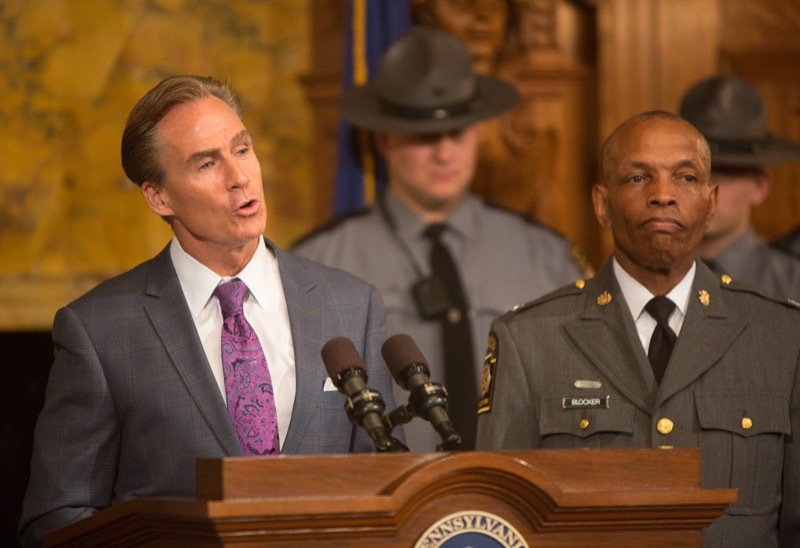 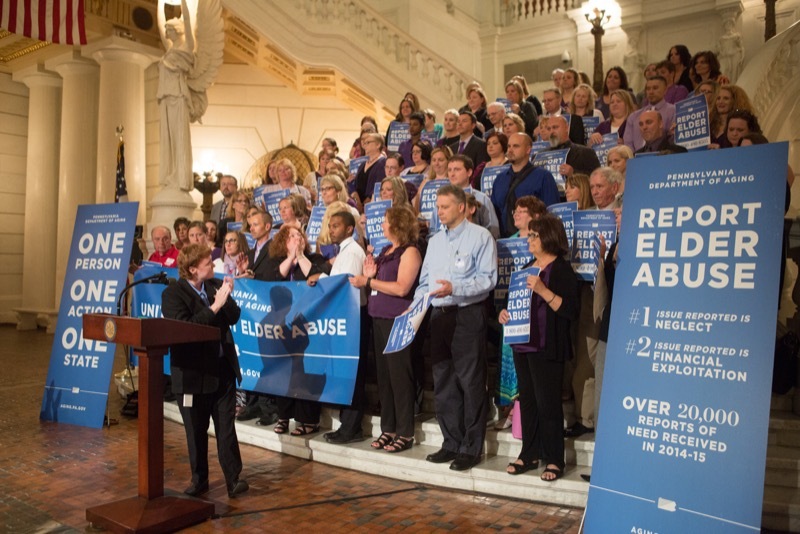 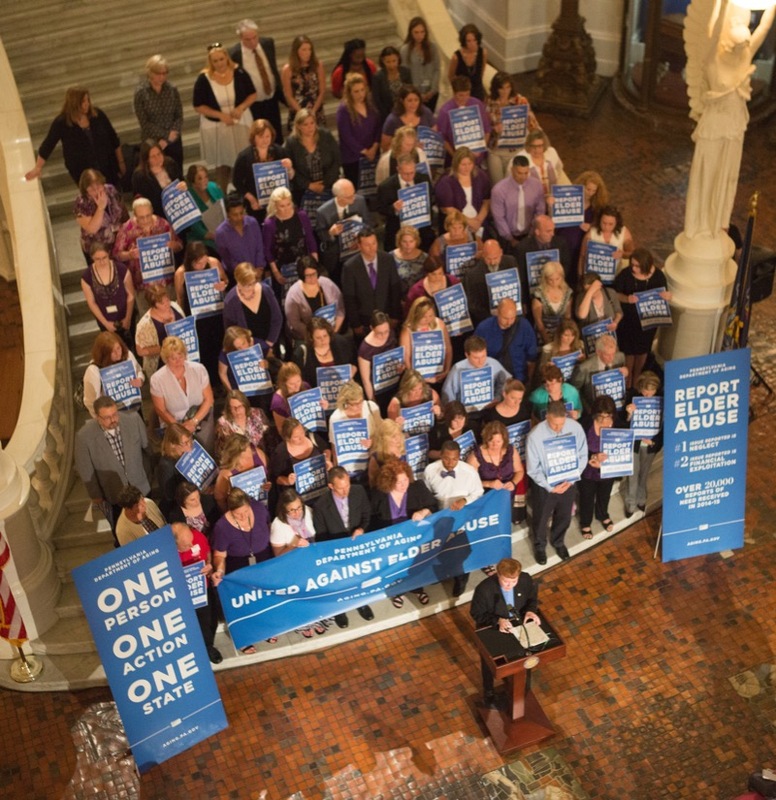 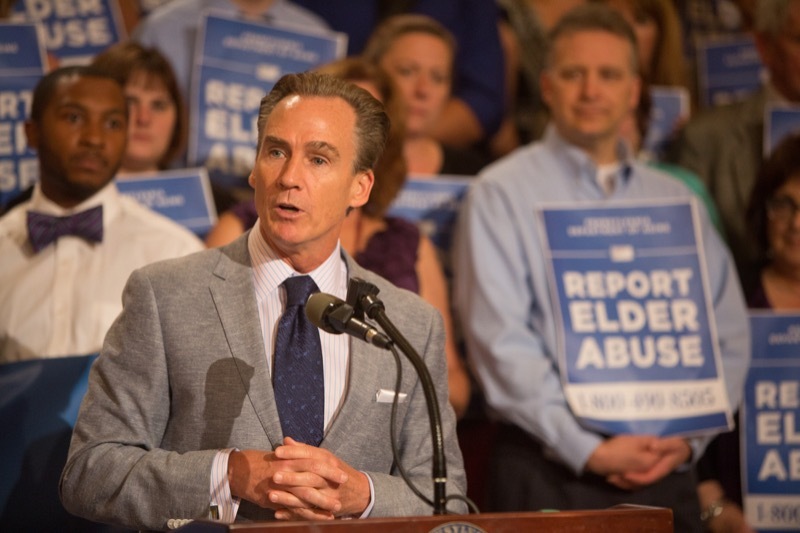 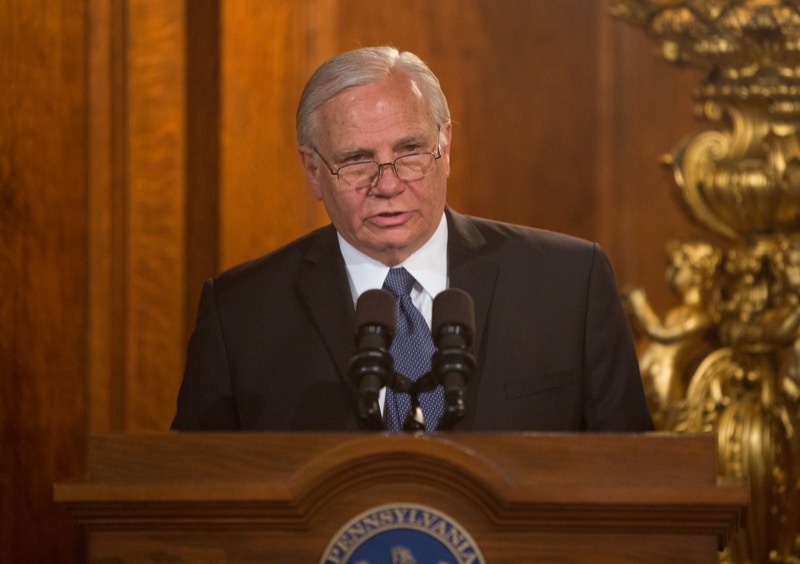 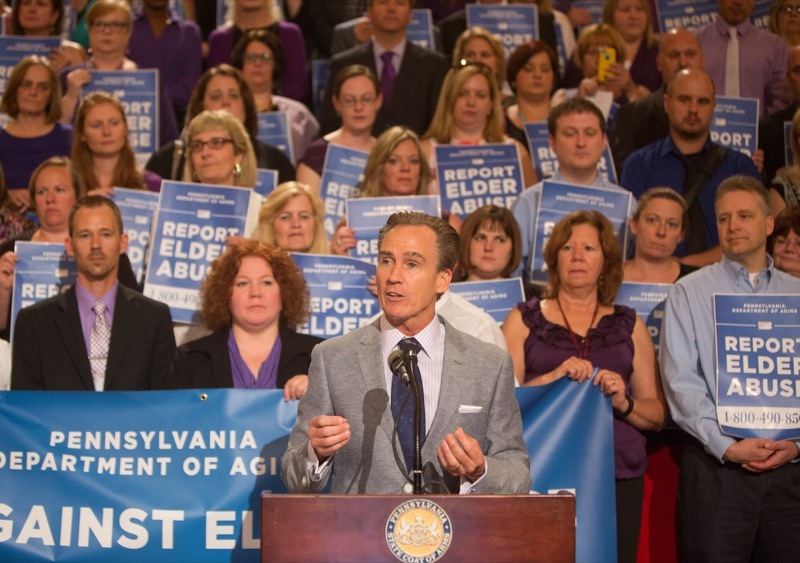 Today, Lieutenant Governor Mike Stack joined Secretary of Aging Teresa Osborne, and Deputy Secretary of Banking and Securities Brian LaForme in a World Elder Abuse Awareness Day event in the Capitol calling on all Pennsylvanians to stand united with communities around the globe to raise awareness about elder abuse, neglect and exploitation. 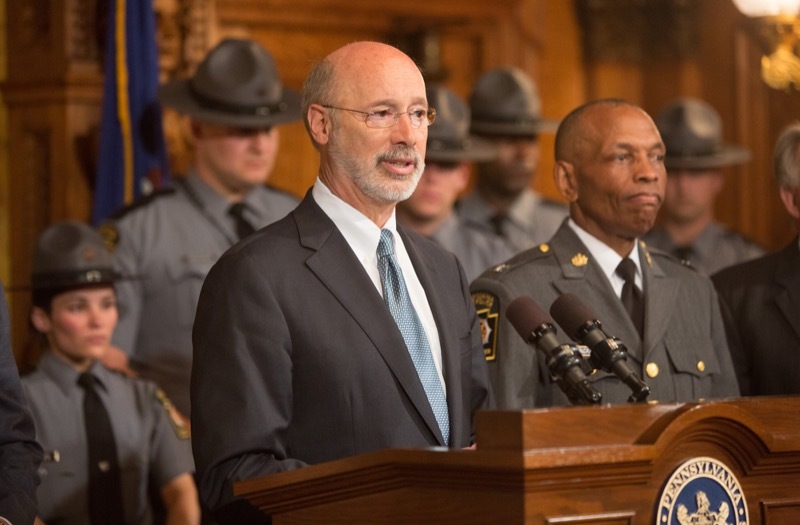 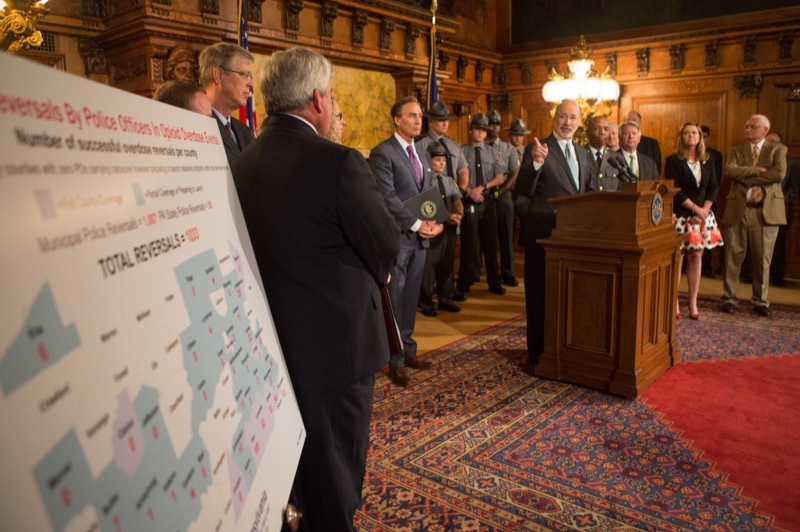 Governor Tom Wolf today recognized police officers across the Commonwealth for reversing more than 1,000 opioid overdoses in over one year. 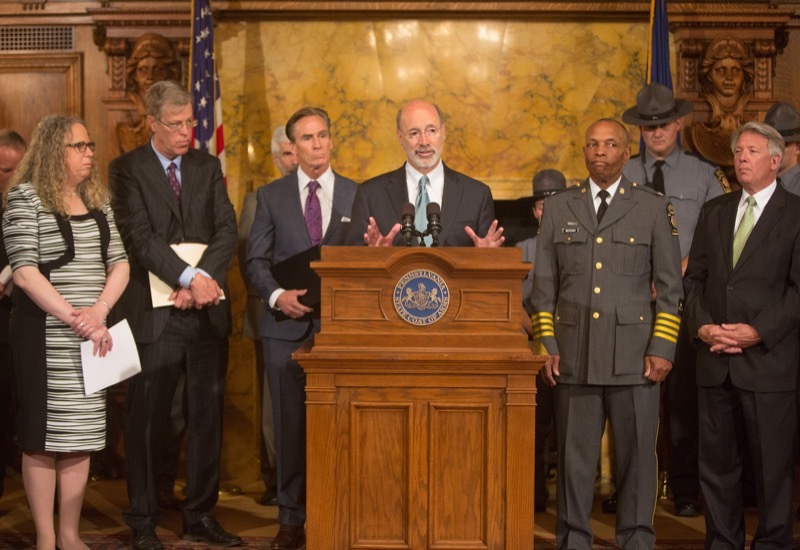 The Wolf Administration made Naloxone available to State Police and other law enforcement and emergency personnel in April 2015. 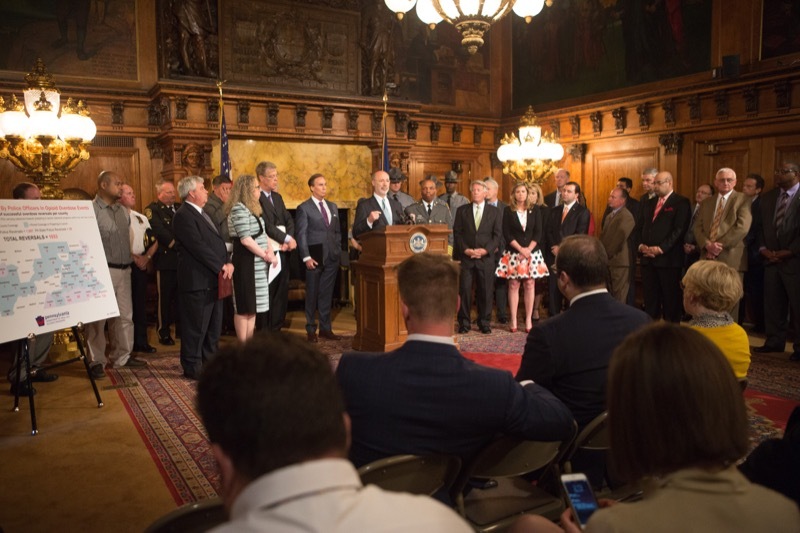 This week, Governor Wolf took the most significant step the commonwealth has taken to reform our liquor system in 80 years by signing a bipartisan, compromise liquor modernization bill. 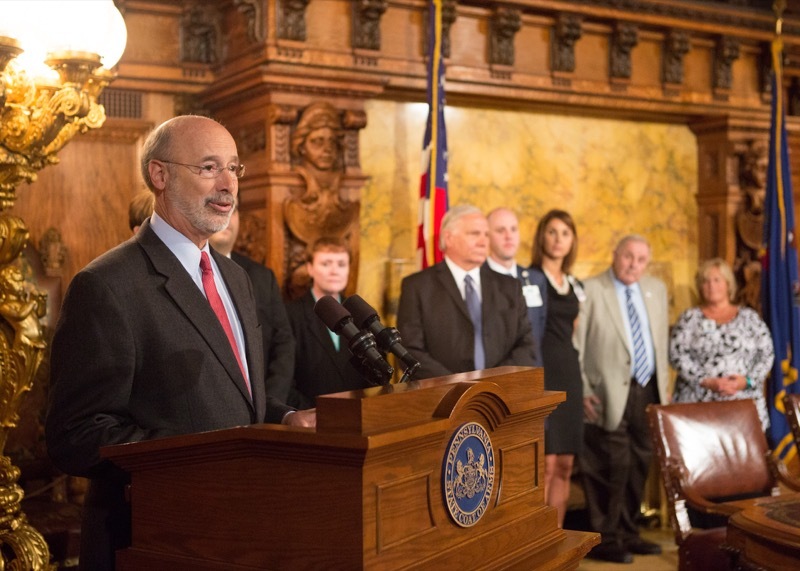 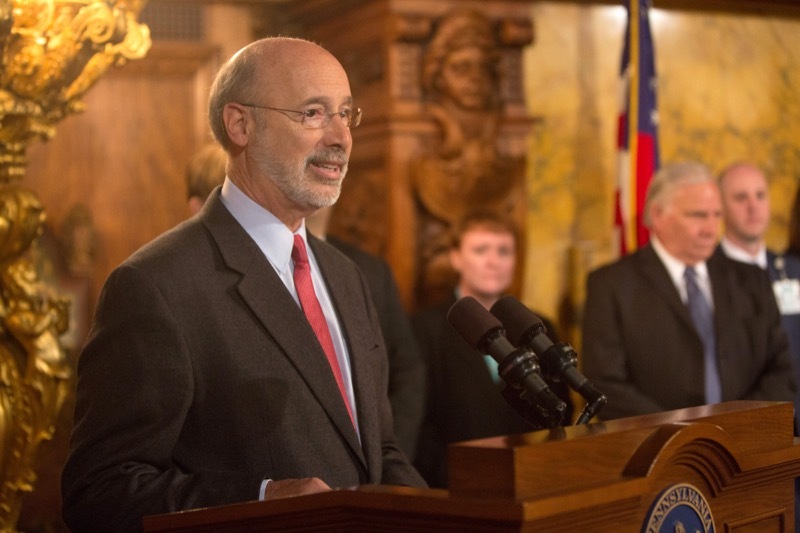 Governor Wolf's goal has always been to modernize the sale of liquor and beer in Pennsylvania and this reform package will finally bring Pennsylvania's wine and spirits system into the 21st century. 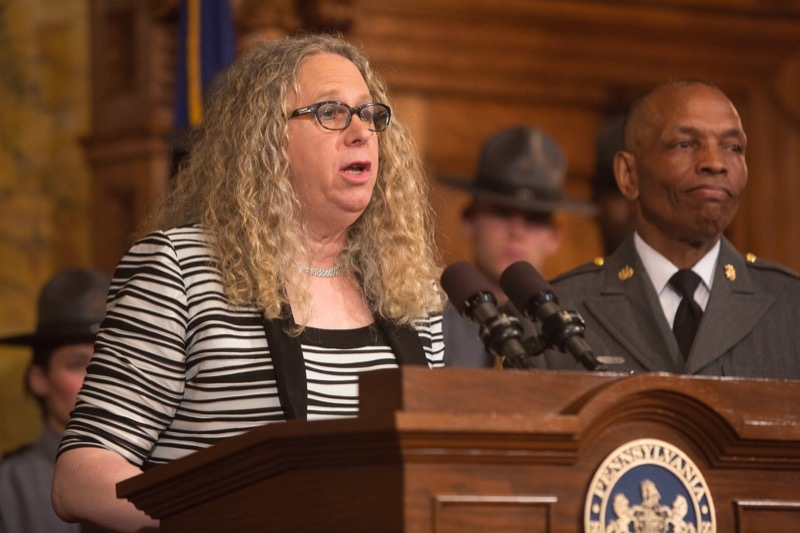 This bill will allow grocery stores that currently sell beer to sell up to four bottles of wine, will permit restaurants and hotels to sell up to four bottles of wine for take-out, and removes Sunday restrictions and state-mandated holidays. 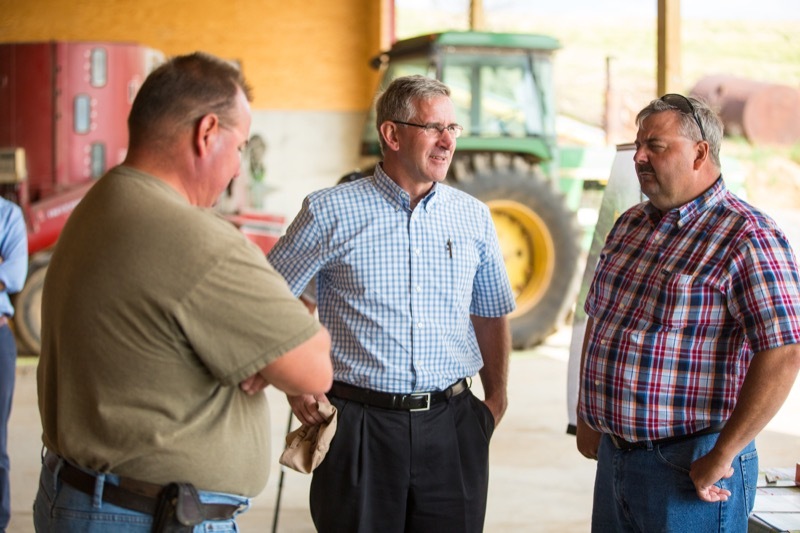 Manchester, PA - Farmers throughout Pennsylvania, including those in the Chesapeake Bay watershed, are doing their part to improve water quality by implementing good conservation practices, said Agriculture Secretary Russell Redding as he toured the Gross Family Cold Springs Farm & Pet, LLC in York County today, calling it an example of environmental stewardship. 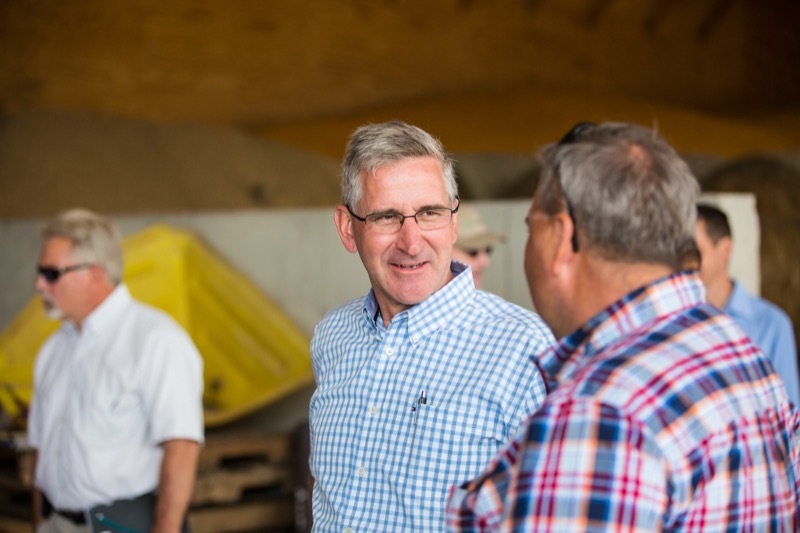 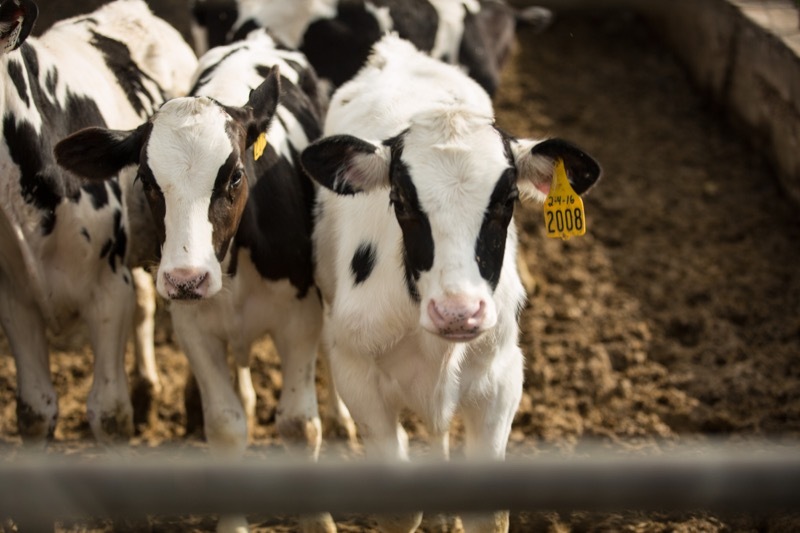 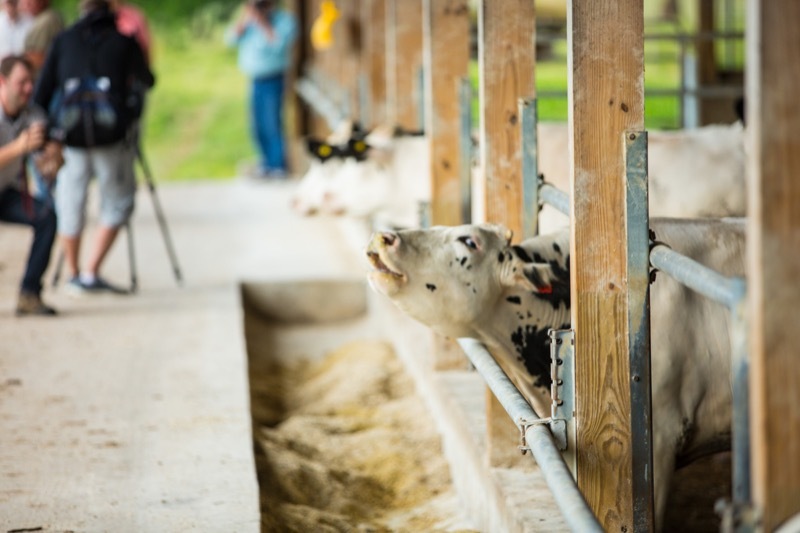 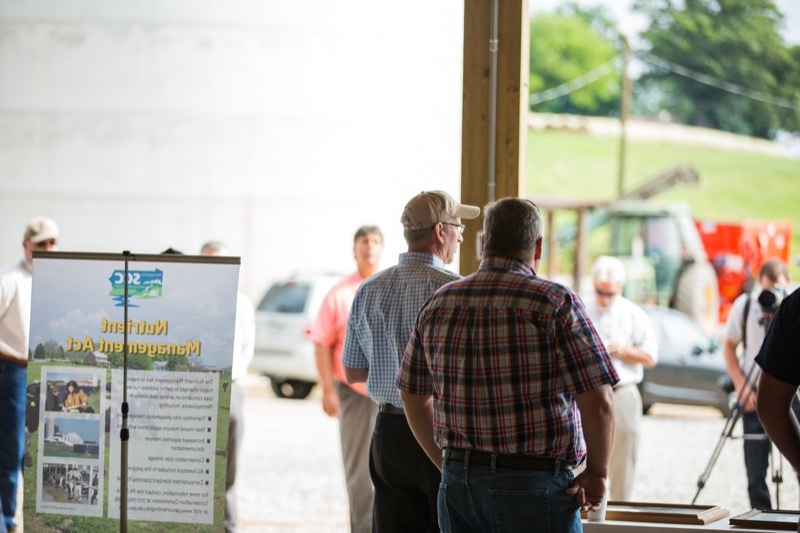 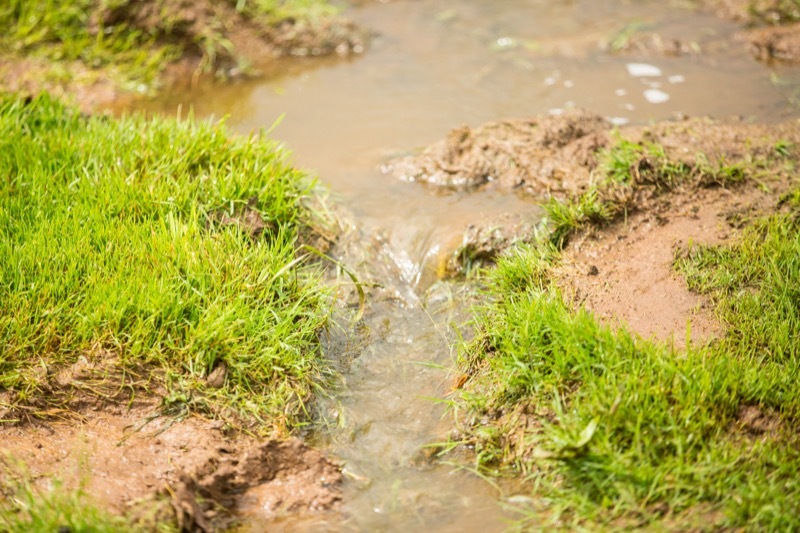 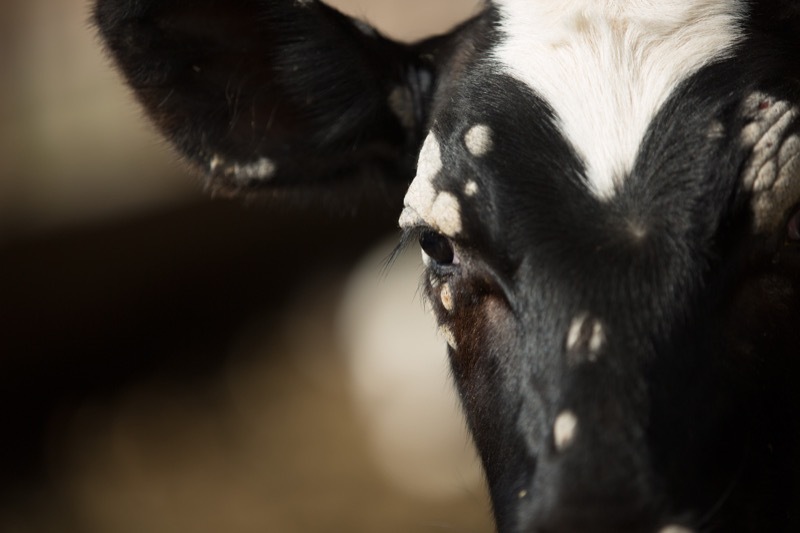 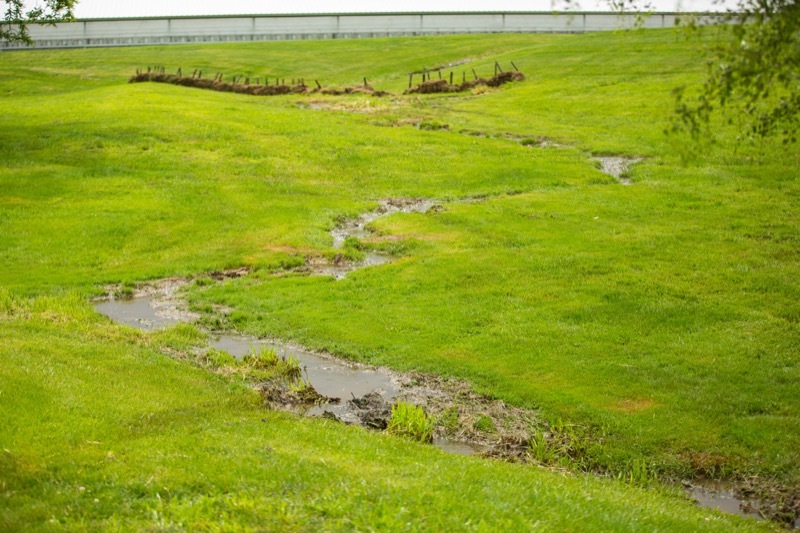 Farmers throughout Pennsylvania, including those in the Chesapeake Bay watershed, are doing their part to improve water quality by implementing good conservation practices, said Agriculture Secretary Russell Redding as he toured the Gross family farm in York County today, calling it an example of environmental stewardship.